Unit 18, Lot 25; TOT ID# 1633. 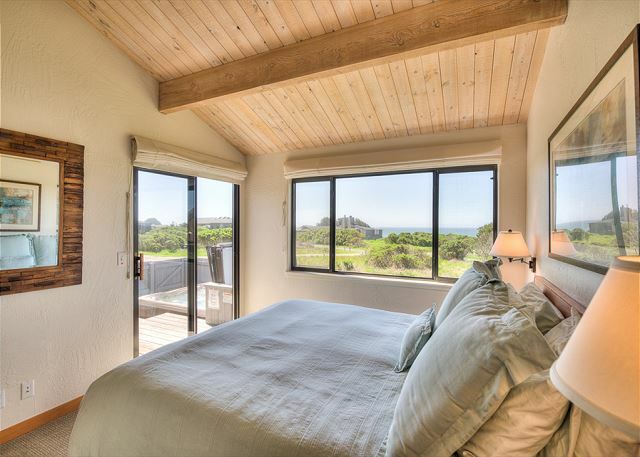 As you turn off Highway One onto Whitesurf Road you will be greeted by a breathtaking view of the Ocean. 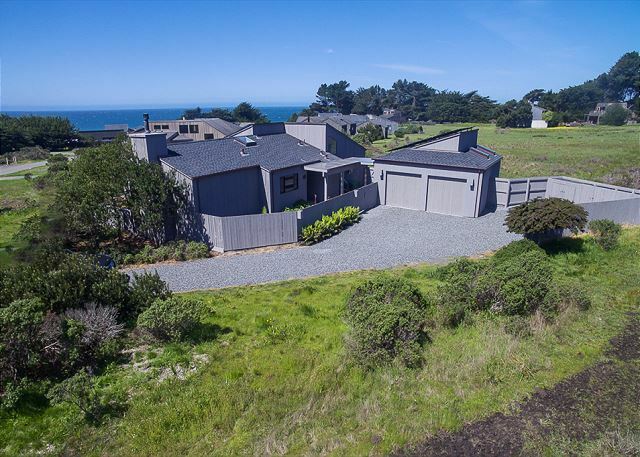 You are only two blocks away from the Odyss-Sea, a charming cozy one story home located in the meadow and surrounded by open space/common area with views of the ocean to the southwest and the high ridge line to the northeast. My mom, sisters and I needed to "get out of Dodge", and we could not have picked a better place. The home is idyllic, the views are gorgeous, and the area in general is so serene. It was perfect!! We loved the house and had a good time, but it would have been even more perfect if we had had instructions on how to access Netflix and Amazon on the Smart TV. We finally figured it out but it was complicated. Also the description of the house included a Blueray DVD player. We looked but didn't find one. 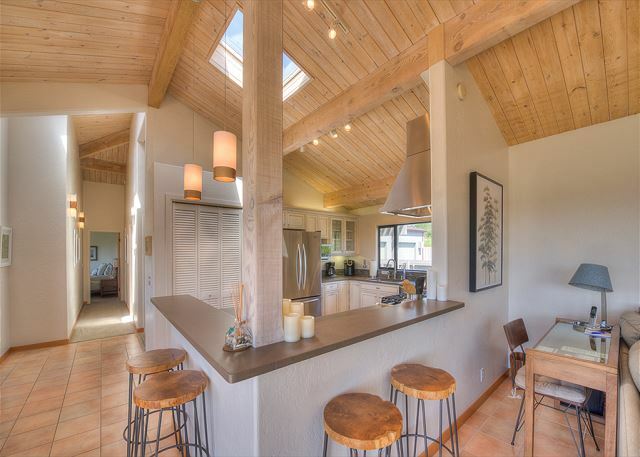 I love going to Sea Ranch and I love this home. I cannot think of one negative aspect of our stay at Sea Ranch. Everything was just perfect at Odyss-sea. 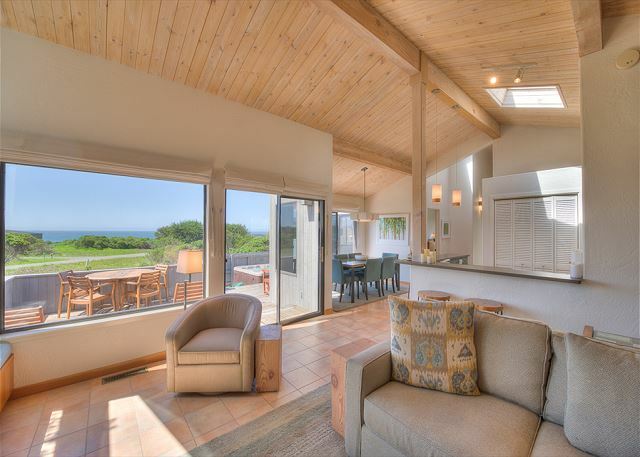 The owners thought of every detail ...a home away from home, but with an ocean view. 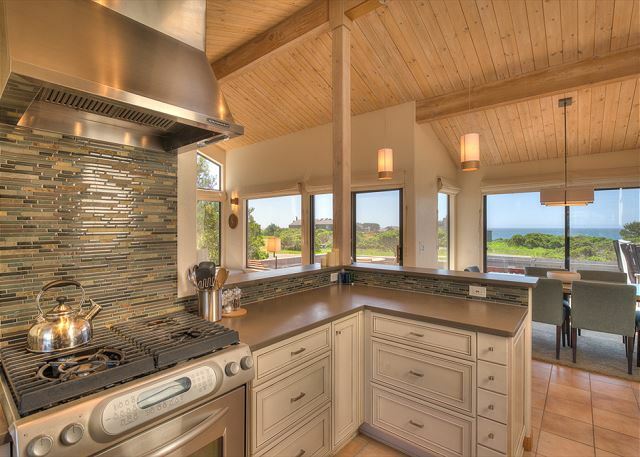 From the beautiful kitchen to the slide windows on the deck, so that the ocean would be visible from the hot tub. Clearly, much thought was given to ensure a wonderful stay would be had by all, including the dog! This home has everything you need/want to be comfortable during your stay. It's a short walk to some of the best tide pools I have been to. This rental is clean, organized, and a perfect location. Thanks for a wonderful stay! Tasteful decor, comfortable, top quality furnishings (beds, sofas kitchen, etc. ), pristine condition, fully and thoughtfully equipped with everything we could have wanted and more. The care of the owners really shows. Organized, clean and easy. Lovely stay and I will be back. I have been going to Sea Ranch for over 30 years and love the atmosphere and meditative feeling it affords me. 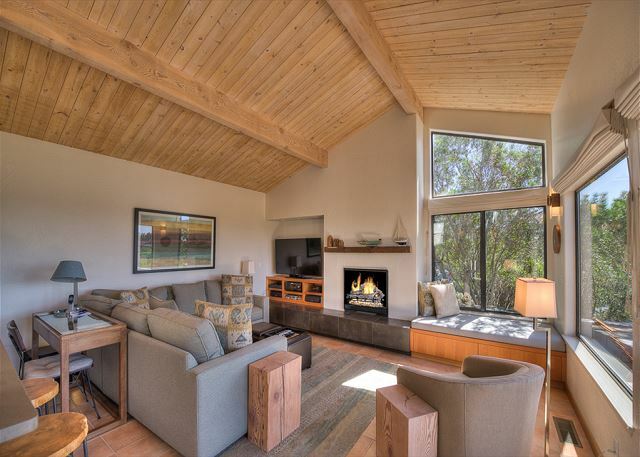 This home fits like a glove in its amenities and comfy style. we had a great stay at odyss-sea. the house was so clean and the kitchen was a dream to work in. i could hear the ocean at night and our dog loved laying in the sun in the enclosed patio during the day. i liked the personal touches of this dog friendly house. 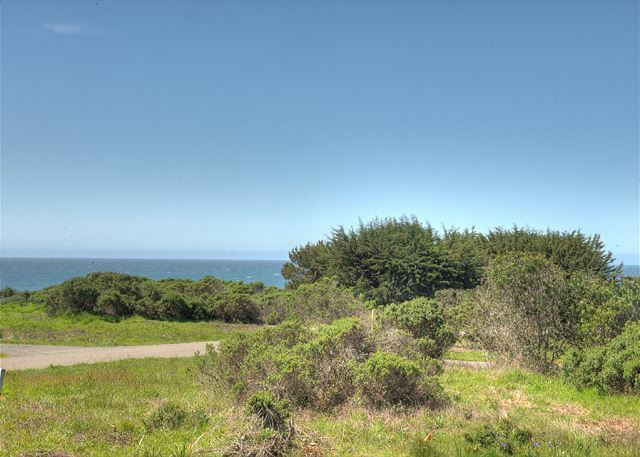 We've rented many places in Sea Ranch in different areas. This is a great house close to the bluff trail. Lovely furnishings, obviously done with care, just the right amount of casual. We rented over Thanksgiving so the kitchen was vital -- we found all the equipment we needed which is not so common. Stayed here in early November with my wife and children, and also our Labrador retriever. The home was very comfortable and the amenities were nice too. 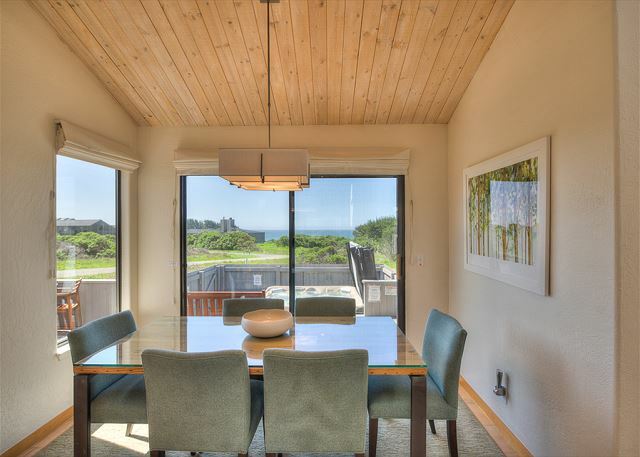 The home is ~150-200 yards from the ocean, with an expansive view from large windows and sliding glass doors. 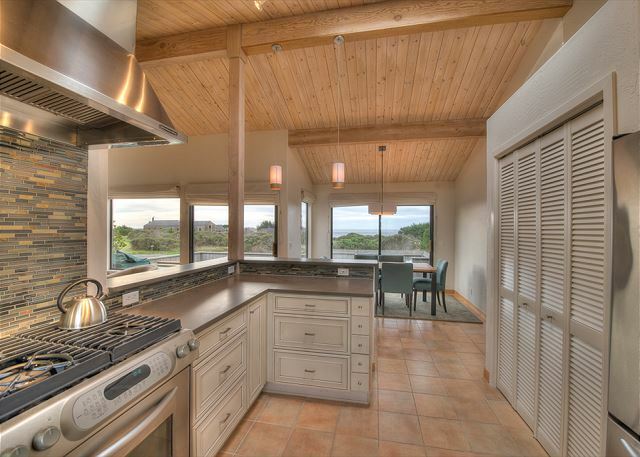 While I don't think there is a 'bad' house in all of Sea Ranch, this one was one of our favorites. total necessity for us, dog friendly, great kitchen , back deck, closed in front yard with BBQ and the hot tub ! The house is modern , plenty of room to relax. The first time we stayed it rained the whole week! No problem ! This last week , pristine weather , beautiful! Told the wife this is our go to from now on! Don’t want to check anything else out! We stay at Odyss-Sea regularly and it is now our go-to home at Sea Ranch. The kitchen is well equipped, I finally have figured out how to operate the TV/DVD and the bedding is comfortable - great pillows. It is a joy to get into bed with the windows open and listen to the surf. The Odyssey had everything we could possibly want. It was extremely clean, warm when we entered and furnished comfortably. We had a great place to relax and visit which was why we came! The house has been nicely remodeled and furnished with attractive furniture that fits the spaces. Owners are so thoughtful -- closets have slide-out baskets for clothing, bedrooms have bedside reading lamps and clocks. The fenced garden on the driveway side of the house was beautiful -- and it's great for giving a dog some outdoor lounging space. Deck is attractive and nicely furnished. Kitchen is spacious and well -equipped with good -quality gear. We plan to return! Every visit to Sea Ranch is special but this one seemed to feature all of the magical qualities of the venue including deer, pelicans, coyotes, beautiful sunrises and a lovely garden at Del Mar Center, yoga classes, great swims in the pools, and long, leisurely walks. Our home offered every amenity we could think of and easy "how to" instructions on how to operate the satellite TV! My Husband and I have been visiting Sea Ranch for many years now and always enjoy the peace and quiet, our walks and just unwinding. This was our first visit to this particular property and we found it to be a good choice for us with all of the comforts of home and more. It was very clean and well decorated. The kitchen was lovely and we were happily surprised to find that it had all of the items we would need during our stay. Wow what a wonderful home in such a beautiful location. A big thank you to the owners for thinking of every last detail to ensure an amazing stay! We stay at many vacation homes and this is one of the cleanest and most comfortable houses we have ever stayed at. Everything you need is at Odyss-Sea, the house is very clean, the beds and linens are heavenly, and the house is close to hiking trails, the water, the activity center. We will definitely be back with our family. Great for small kids, great for dogs, great for families! We had an amazing vacation at Sea Ranch. The house was very well organized and it had everything we needed even supplies for our dog, including dog poop bags, a leash, and a treat! We loved the deck, the lounge chairs, hot tub and the view! We had the absolute best time at Odyss-Sea. 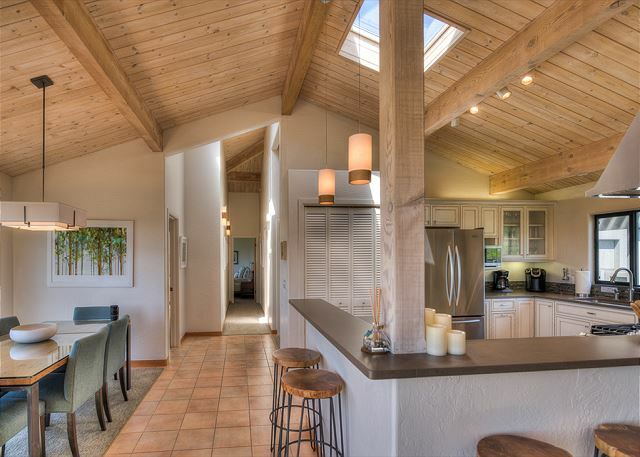 We have been going to Sea Ranch for over 20 years and this was one of the very best homes we have stayed in. The house could not have been any better. We had the perfect mix of sun and rain for a magical Sea Ranch escape. Our stay at the Odyss-Sea was wonderful, relaxing, and refreshing. The house was clean and the owners thought if everything! We appreciated the gas fireplace, the hot tob, fully stocked kitchen and towel warmer in the master bathroom... it all was exceptional....we couldn't have picked a more perfect "dog friendly" house!! We are looking forward to staying here again soon. The Odyss-Sea was perfectly appointed and in a wonderful location - steps from the ocean trail. 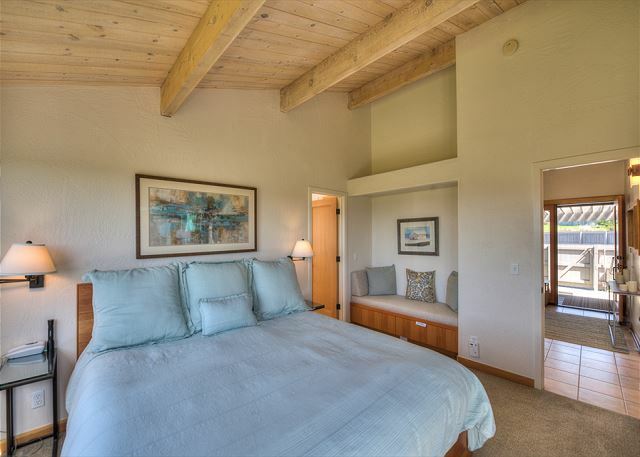 Everything about the home was thoughtfully done - from high end appliances to luxurious linens. For many years Sea Ranch has been favorite place for us to go. This visit was no exception. Odyssa-Sea was a very bright and comfortable house plus it was dog friendly. Saw lots of deer, seals and quail and our dog stalked the quail at every opportunity. Would happily return. From the moment I walked into this home I was impressed. It smelled great, very clean, beautifully decorated, etc. Then I started putting away all our stuff and realized that they didn't miss a thing. There was a place for everything. Then the kitchen, so well equipped, everything was top notch and beautiful. The views were lovely from every window. The garden in the front was perfect for our dog in between the very long walks we took. The sheets were butter soft, but cool to the touch. We had family visit that owns a home up the hill and prior to that rented for 30 years at Sea Ranch and said this was by far the nicest dog-friendly home in Sea Ranch. The owners thought of everything and beyond to make our stay comfortable, beautiful and so inviting for us, our dog and our friends. I can't wait to return to this home. While there we hiked, visited the lighthouse in Pt. Arena, and played games sitting at the comfortable dining room table. We ate, drank and thoroughly enjoyed just hanging out in this lovely home. A beautiful home in a beautiful area - so clean, easy, uncomplicated and serene. Spent July 4th at Odyss-Sea...3 People, one dog. Plenty of room and comfortable for all ( including pooch). We had rented this previously so knew it would be great! Nicely furnished and kitchen well equipped. New hot tub was silent! Location peaceful and quiet. We will rent again. 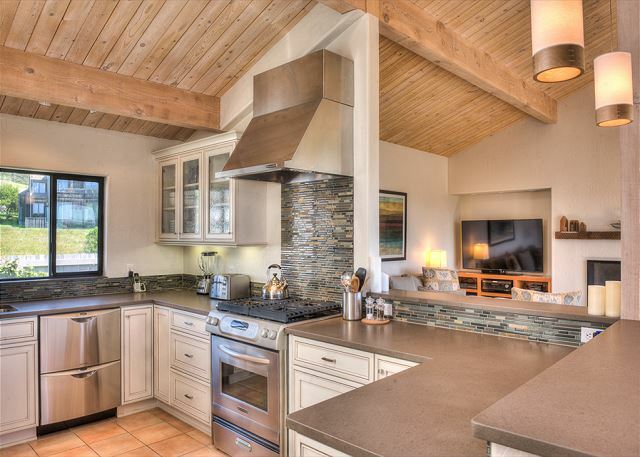 This home is beautifully landscaped, with a well equipped kitchen, and beautiful views of the ocean. We loved sitting on the deck enjoying the ocean, deer and soaking up the sun. I really enjoyed spending ten days at this house with my two dogs. The house has been remodeled recently. It is NICE -- nice (and spacious) kitchen and appliances, nice bathrooms, nice dishes, wine glasses, pots and pans, tableware. The kitchen -- as another reviewer has said -- has everything! There is a fenced area right outside the front door where dogs can do their "business" (putting my dogs on leashes for first-in-the-morning "go potty" is not my idea of fun). The owners have provided blankets to use in covering the furniture and the beds -- just in case your dogs (like mine) are accustomed to being on the sofa or bed. We will definitely go back. You walk on streets for 5-to-10 minutes to reach the bluff trail -- but that didn't bother me. Nice view of the ocean from the living room/dining room area and from two of the bedrooms. There is nothing but meadow on one side of the house and behind the house -- very quiet and peaceful. The house is on a cul-de-sac, so there is very little traffic. This was a beautiful home that lived up to its pictures on the rental sight. Really enjoyed it! House was very nice. Odyss-Sea is a modern home that has all of the comforts that we would expect in our own home. 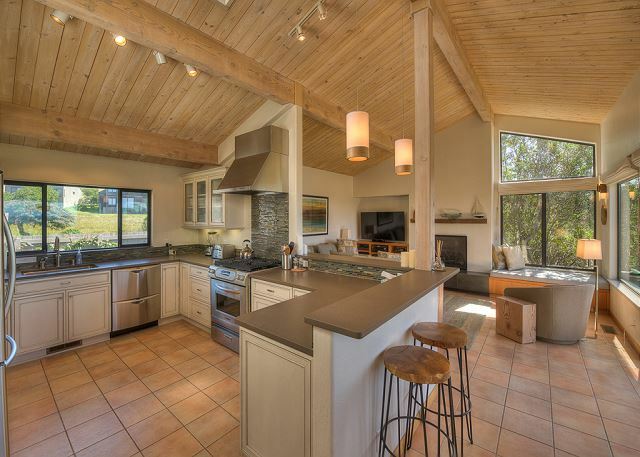 Great kitchen and living areas that allowed for a very relaxing visit. Great location for access to walking trails along the coast. We highly recommend this home and will consider returning in the future. 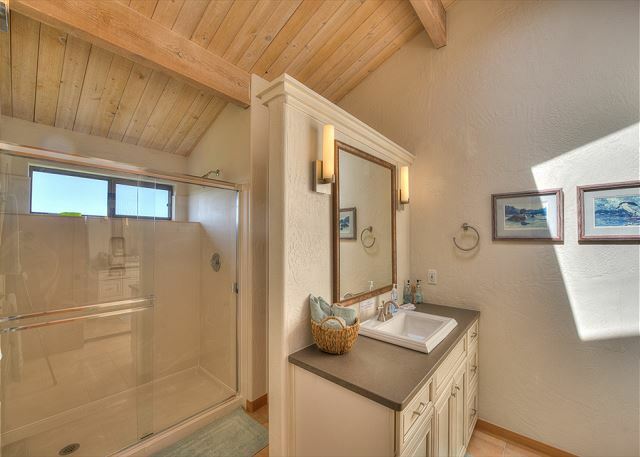 Truly a well-decorated and comfortable home, great for 3 couples and/or families. The best equipped kitchen, big screen TV, cozy gas fireplace perfect for cool nights and mornings, nice outdoor deck furniture, great hot tub, high-end mattresses and duvets, etc.!!! Great walks to different beaches. Lovely home - great kitchen! Our familiar 5 plus dog had a glorious stay in Odyss-Sea over Christmas. It is very well-designed and equipped with everything a guest might need. The enclosed deck and outdoor areas were perfect for people and canines and there are appliances and furnishings that I wish I had at my own home. Excellent house. Very comfortable furniture and beds. Kitchen had everything anyone could need. Great view of ocean too. Looks like this home was bought and redone in 2014. Owner did an excellent job. A very beautifully, up to the minute renovation and update of all features. Fantastic decor and extremely well supplied with every comfort and convenience. Location perfect for view, but we usually prefer to be closer to golf and town. This did not spoil our visit and we would definitely return and recommend to others. Perfect for getaway from SF. New hot tub. Quiet location...not too much foot traffic or cars. Enjoyed reading, bluff walks, and deck area very convenient. Only drawback was that visit during season for those pesky little flies. We have visited other homes in Sea Ranch before, for just for a weekend. This time we stayed for ten days, so it really felt like we lived there. And who wouldn't want to live in this house? The towel and blanket supplies were generous, and honestly the kitchen was superb! Nothing was lacking in the kitchen, so we prepared every dinner there, with the exception of the last night when we enjoyed the bar menu at St. Orres. The rental agency staff were friendly and responsive. We will surely hope to stay at Odyssea again! It was very good overall. The Odys-Sea home met our expectations in every way, from the so-comfortable beds to the beautiful ocean views. Our dog felt right at home too and none of us wanted to leave. We would definitely come back to Odys-Sea again whenever we need a 3-bedroom unit. Thank you to the owners for letting us share your home. We've been renting from Beach Rentals for over 25 years and this is one of the best houses we've stayed in - and most comfortable. New on the listing, it was perfect for me and my husband and our little dog Ollie, but could easily accomodate 2 couples or a family of 4-6. Both the hot tub deck and the front yard are fully fenced (even for our little 6 pounder! 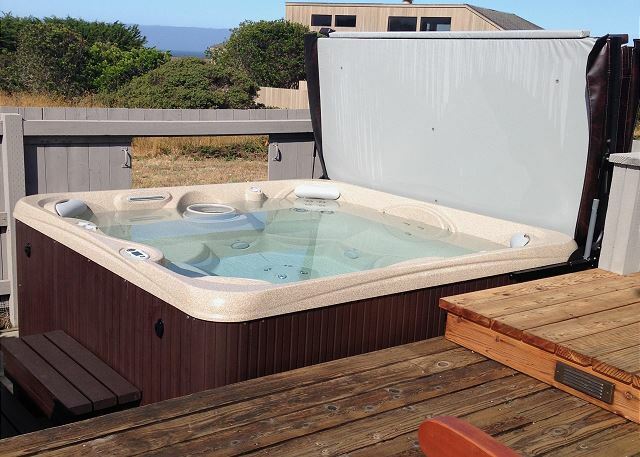 ), great hot tub with deck flush with tub on one side so Ollie could see us, super kitchen fully stocked, very comfortable furniture, beds, media, fireplace. Bring your sunscreen because the hot tub is not in the shade, and even if the sun isn't hot with the reflection of the water my husband got a nice burn! (Not me, I tan) Nice blue water view and new teak deck furniture including a double rocker. Great one-story floor plan, very nice modern design, very quiet, we really enjoyed our stay, will request this house again. 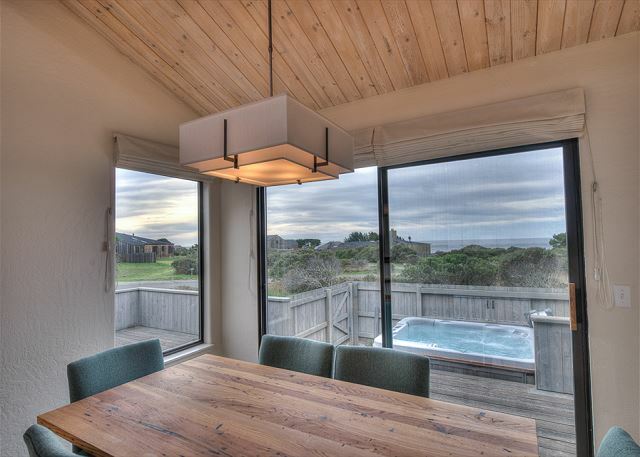 Thanks Beach Rentals for having the best houses at Sea Ranch! Great House. Beds top of the line plush. Best outfitted kitchen I have ever cooked in. Newly redecorated. 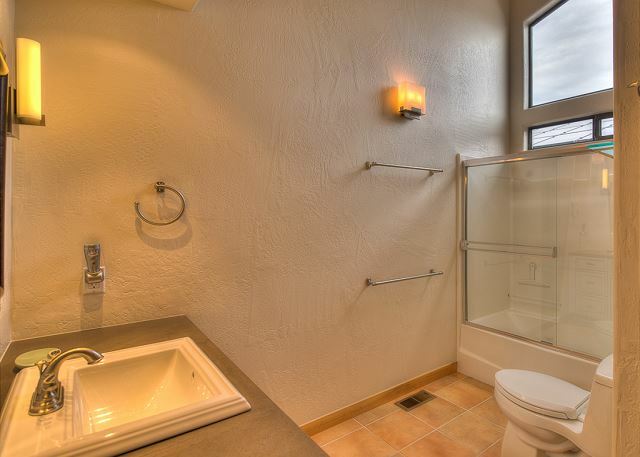 Everything is excellent in this vacation home. Except the curtains of the house is white. The room is too bright to take a nap during the day. We enjoyed our stay here and would recommend this home to others. Only comment would be to have better instructions to go from TV to CD player with the 3 remotes for us non techies otherwise it is a beautiful home well stocked kitchen,beautiful linens and very comfortable.Beach Rentals are wonderful to rent from so kind and helpful. We spent a lovely weekend at Odys-Sea. It is a beautiful home, thoughtfully laid-out, and spotlessly clean. Everything felt brand new after the recent renovation and the space worked perfectly for my husband & I, our toddler, and our dog. The outside space is all enclosed which worked fantastic for us as I didn't have to worry about everyone playing outside and wandering off. I would highly recommend this delightful home and the property management group. Very clean, modern updates, comfortable accommodations. They have equips this rental with everything you could possibly need to make it feel like home. Great place to get away! So new and fresh and clean. Tastefully decorated. Top quality and modern appliances.Comfortable beds and great towels and linens. 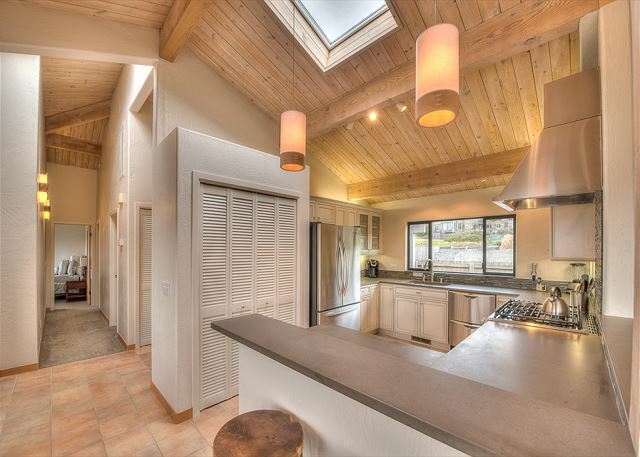 Loved the kitchen and open floor plan. Entertainment components needed better instructions to operate. Access to trails and beaches a bit difficult to navigate and not as close as we thought. All in all, loved the house. AWESOME!!! 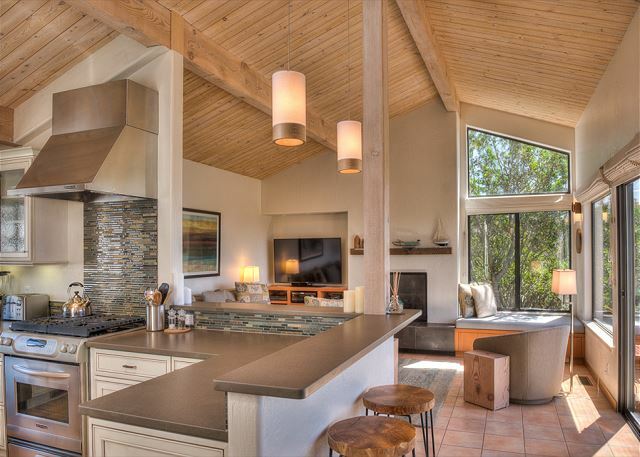 Loved this Sea Ranch home! Beautiful home, great location, most comfortable beds and includes everything you need in the kitchen! Already booked another upcoming weekend! 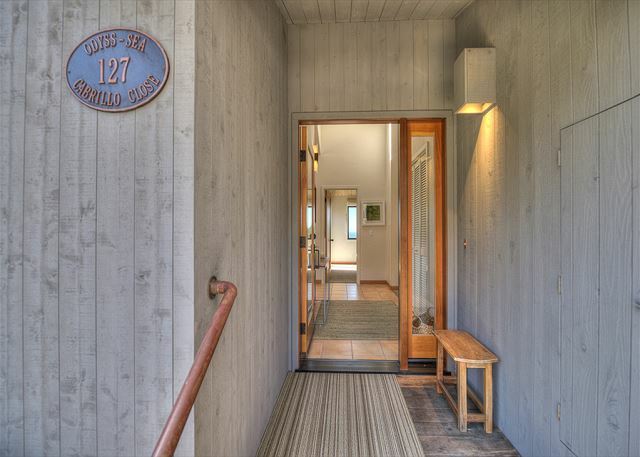 Odys-Sea is a beautifully renovated home. Great amenities including a fully equipped kitchen - great knives, utensils, wine glasses. I appreciate those touches. Dog friendly with doggie blankets. We don't let our dog get on furniture, but it was a nice touch and he enjoyed the cuddle on his doggie bed. We enjoyed staying in and cooking, but also went to Two Fish for breakfast and the Sea Ranch Lodge for a lunch. Long hikes along the coast on a misty weekend and playing with our dog on the beach. Perfect!! Amazingly Relaxing and Just What We Needed! My girlfriends and I get together a couple times a year and go somewhere fun, usually by the ocean. It's our girls weekend, and we love our time together. This trip was a little more special than some of the others, at least to me, in that I'm pregnant with my first child, and I know life will likely not be the same after she's born! 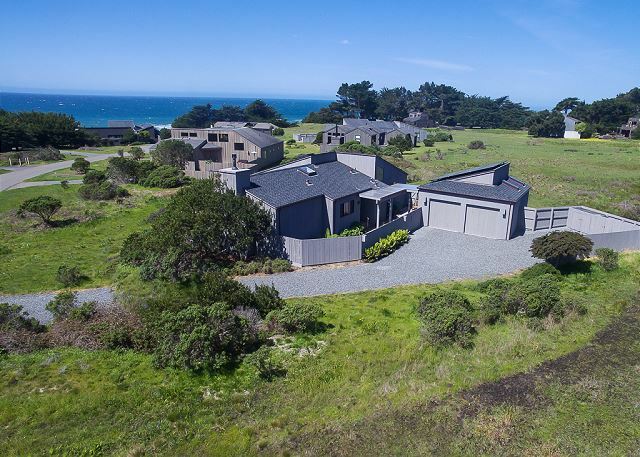 We decided on Sea Ranch for a multitude of reasons, and were not disappointed! The area is as beautiful as advertised, and the Odyss-Sea is amazing! 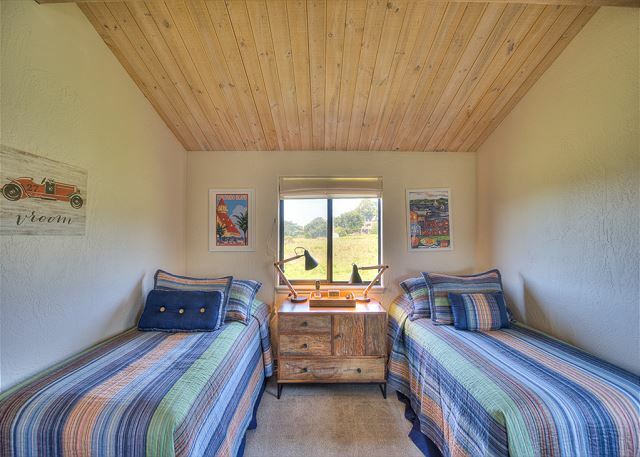 The beds are like pillows sent from above, the house layout is very open, but allows for privacy and time away if needed, the view is fantastic, and the kitchen is a dream, even though we didn't use it to the full extent it could have been used! We went for several walks along the bluffs each day, we enjoyed breakfast in Gualala one morning, and generally just had a very relaxing time. Our trip was everything we wanted and needed it to be, and everyone (including our doggy guest) had an amazing time. We will be back!! We had a great time and would go back in a heartbeat! We loved this home the minute we walked in. Beautifully and efficiently decorated. Enclosed courtyard entry, back deck and hot tub also enclosed. Our small dog could safely go out to both areas. We love to cook and everything we needed was there. Super nice linens as well.